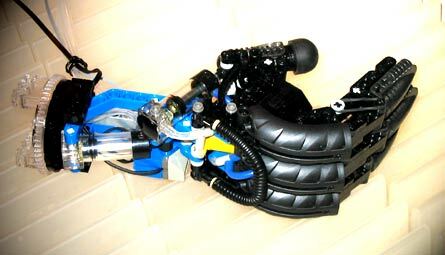 It is a creation from Christophe Masclet (aka Chrismaker) which named it 'LEGOTIC-Hand'. 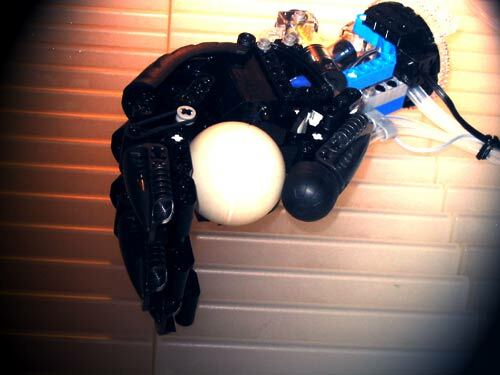 It's like an android or humanoid hand, made of LEGO parts. 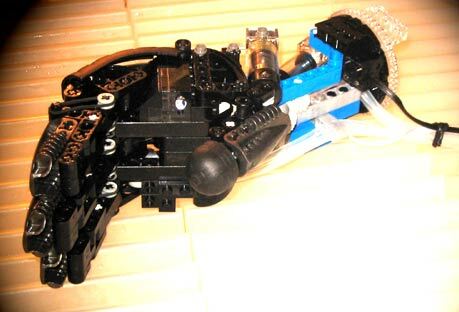 Mainly TECHNIC, MINDSTORMS and Bionicle parts. 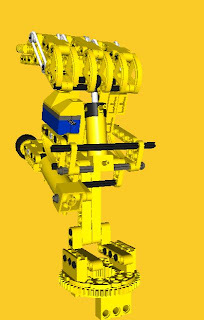 Thanks to the use of pneumatic cylinders, it's possible to actuate the wrist and the four fingers. Each finger at this self-adapting hand, has the ability to adjust itself around an object. an integrated IR sensor brick, makes it possible to detect the presence of close objects, near to the palm. a rotation sensor makes it possible to determine the angle formed between the wrist and the hand. The pneumatic cylinders are light, reliable and can push up to 2Kg. They are of great use to control the fingers and as in opposition to motors, they do not stall. 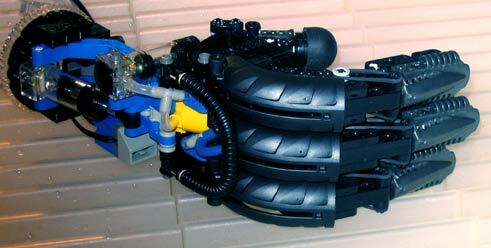 Usually they can be feed by a double-compressor and controlled by motorized pneumatic valves. Each finger has mechanical faculty to be rolled up and to adapt to a seized object, thus a cube or a sphere are not held in the same way. Thanks to the use of rubber bands, each finger returns to the rest position when the push force ceases. 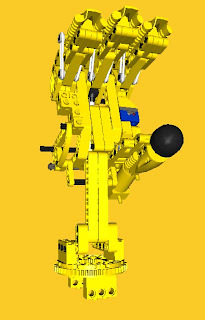 The three fingers are fixed at the same axle and actuated by one cylinder, making it possible to the whole hand to open and close itself. It results from this, that all fingers are folded up at the same time but adapt independently to the form of the seized object. As for the thumb, it is actuated by its own cylinder and comes to strongly grip the palm. 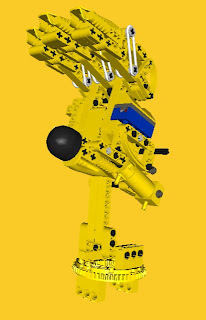 The fingers, do not require any particular position encoder, as they are simply opened or closed by the means of motorized pneumatic valves (would love to see this part of the model...). In what concerned the aesthetics, each part was chosen for its mechanical and aesthetic characteristics, not hesitating the author to pick out of the TECHNIC range of parts. The model was designed, using an incremental construction method. This building method, even if it requires twice the parts, makes it possible to optimize the object gradually, leading on complex and advanced objects. 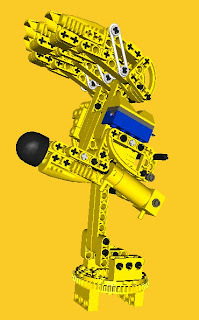 According to the author, the LEGOTIC-Hand required about thirty of these stages. Without this technique, it would have been impossible to conceive it. Afterwards another builder (Frédéric Gorzelanczyk) made his version of this hand, despite it is not clear which were the modifications or improvements achieved. The human hand is a remarkable instrument from the nature, that robotic engineers try to reproduce, since longtime. With more than 20 degrees of freedom, 19 muscles, 17 articulations, 19 bones (without carpus or wrist, otherwise 27), not to speak about its tendons, nerves and multiple sensors, the human hand is extremely difficult and challenging to reproduce mechanically. 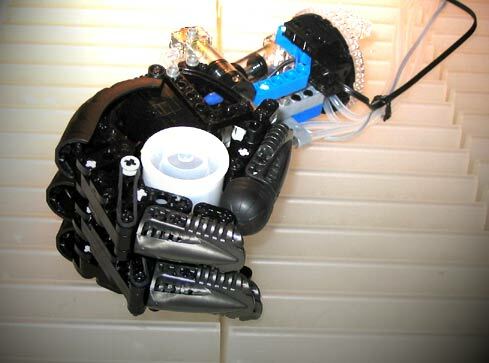 Apart from the LEGO Universe, see below the state of the art in terms of robotic arms/hands. On the left, there is a bionic arm under development for DARPA, by DEKA. The company from Dean Kamen, who also invented the Segway. A project inspired on Star Wars, as they also call it 'Luke Arm' (referencing the artificial hand Luke Skywalker is fitted with, at the end of 'The Empire Strikes Back'). On the right, another DARPA project for the bionic arm prosthetic program. great job on the hand but i can't under stand how you did it and i would like to know if you will be sharing the designs on how to build it.